Animal Help Now directs anyone in the UNITED STATES who encounters a WILDLIFE EMERGENCY to the closest, most appropriate help, 24/7. Use it for orphaned or injured wildlife, stranded marine animals, etc. 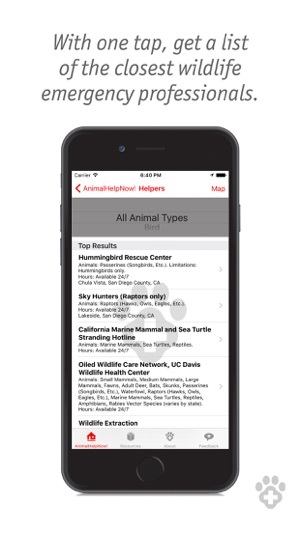 Provides immediate access anywhere in the United States to wildlife rehabilitators, rescues, and hotlines, as well as veterinarians who treat wildlife. Animal Help Now now also directs anyone in the U.S. who is experiencing a WILDLIFE CONFLICT to the closest, most appropriate help. AHNow quickly and easily connects you with humane wildlife consultants and operators so that you can find cruelty-free assistance for "nuisance" wildlife, including pigeons in your attic, skunks under your porch, and the like. 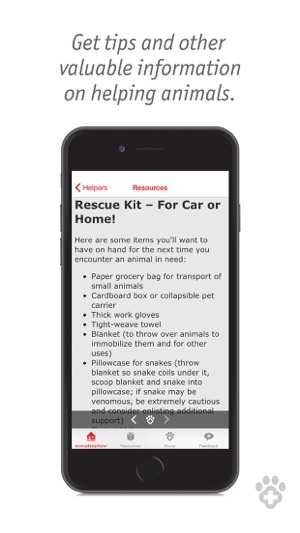 Animal Help Now also provides guidance on how to handle a DOMESTIC ANIMAL EMERGENCY (lost cat, neglected dog, starved horses, etc.). The service's Resources page provides additional information, including preparing for and responding to disasters. Animal Help Now empowers you to help injured and distressed wildlife anywhere in the country. Fix defect in "Email helper" functionality. Addition of helper text on home page. Improved performance. Animal Help Now fills a much needed void for emergency wildlife help! 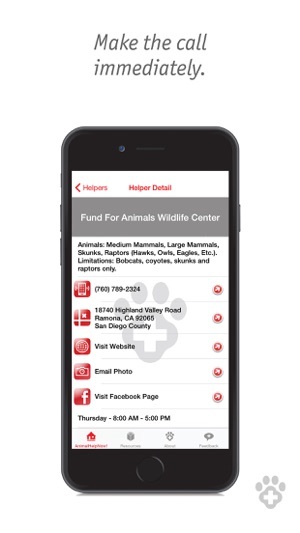 The Animal Help Now app is the answer to emergency help for wildlife! I found the app to be intuitive and nicely laid out. After exploring a bit further, I could tell that a lot of love and planning went into the development. I love the feature allowing you to search for help by animal type. Download the app today so you'll be ready the next time you need help for wildlife! Those of us who care about wildlife and who are willing to help when a bird hits a window or an opossum is injured by a car will find Animal Help Now's lifesaving service to be indispensable. It's easy to use, it covers the ENTIRE UNITED STATES, it contains the country's most current and comprehensive list of wildlife emergency professionals, and it's effective 24/7. On top of this, it helps with domestic animal emergencies in CO and TX, which means if you ever travel with your companion animal in these two states, you'll have access to the closest emergency vets, should an emergency arise. I've used it many times, always with success. After running into a wildlife emergency I found this app after being unable to find local assistance. After emailing the issue, I was contacted immediately and offered further information and assistance. The response was immediate, the information forwarded helpful and concise, and above all, kind and considerate. 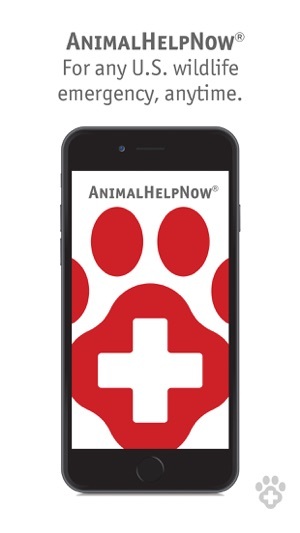 This is an amazing app for anyone seeking aid with any type of situation concerning wildlife or companion pets. Highly recommended.